The Keywords tab offers essential tracking tools for keywords. Link - the keyword is transformed into a link that points to a configured location. 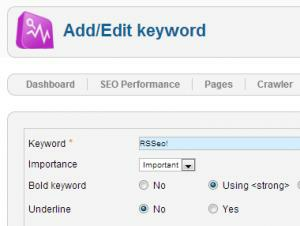 Attributes - you can use this field in order to add a specific class or style to your keywords. For example style="background:red;"
On the general output of this you will also find the calculated keyword position (states the position of your site in the search index with that particular keyword).